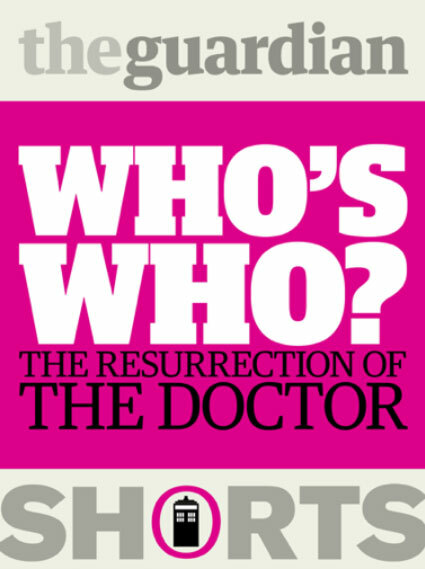 The Guardian has just published the latest in our Guardian Shorts ebook series - “Who’s Who: The Resurrection of the Doctor”. I edited the collection, and it is available on Kindle and in the Apple iBooks store. Re-purposing newspaper content for an ebook is more work than you might expect. Every article starts with the assumption that you are only casually interested in the topic, and need a paragraph of “background”. With this book, I was assuming it was aimed at fans, and so a blow-by-blow account of 48 years of the show’s history wasn’t needed. I opted for putting an article as a “prologue”. It originated in the paper’s Family section’s regular “family dynasty” slot, and Ian Sansom’s article allowed me to remove pretty much any other exposition that Doctor Who started in 1963, and once featured Tom Baker. Always they mention the scarf. Obviously the original articles were written to Guardian house style, and you’d expect a Guardian Short ebook to be in house style. Following those instructions to the letter gives us Tardis, not TARDIS. That just looks so wrong to a Doctor Who fan, so I appealed for my commissioning editor for a style exemption. I also had to try to make sure the book was consistent in talking about Daleks or daleks, Autons or autons. Again, I’ve opted for the Doctor Who convention of capitalising alien species, even though the Guardian would not cap up earthbound species like rhinos or monkeys. And you have to remember that Slitheen is a surname anyway. I’m terrified of errors. Not formatting errors - because it seems to me the process of publishing ebooks has been carefully calibrated to maximise the chance of errors creeping in. They are just a given. No, I’m terrified of Doctor Who errors. Of the Guardian getting hundreds of emails from irate fan purchasers saying “Why does your book say that character x appeared in serial y, when anybody with a passing knowledge of Doctor Who would know, in fact, it was in novel z”. I think the single thing I’m most nervous about is asserting that John Simm was the seventh actor to portray the Master on screen. Roger Delgado, Anthony Ainley and Derek Jacobi - that’s easy. And Peter Pratt and Geoffrey Beevers played the Master as a decaying husk in The Deadly Assassin and The Keeper of Traken respectively. Eric Roberts took the role in the 1996 TV Movie as Paul McGann’s adversary. There are your six, and Simm makes seven. You see how tricky it is? Neither number is satisfactory. For a bunch of people ready to suspend disbelief to the point that a 900 year old Time Lord can travel anywhere in time and space in a battered old police box, Whovians can be incredibly pedantic about the show. Me included. Did you buy the book for the characters, or for the actors? My first collection of material was nearly 60,000 words long, and I needed to edit it down. At the moment we think the optimum length for a Guardian Short is between 25,000 and 40,000 words. Some edits are easy. Every feature about David Tennant talks about how he got the role as Casanova despite not being a typical “pretty boy”, and talks about his growing up in a religious household. Well, you only need that once. But, the childhood stuff, do you actually need that at all? In the end, I wanted to obviously concentrate on what the actors say about the show, but also retain some of their personality. Simon Hattenstone’s feature interview with Billie Piper, for example, is a lengthy and fascinating insight into her life. But the Doctor Who bit of it is very small. Nevertheless, I think that including a lot of the detail about the stress of her pop life and the relationship with Chris Evans rounds out her character as a person, and was worth including. As well as commissioning me to edit it, the Guardian commissioned Jamie Lenman to do some illustrations for it, which add a lovely splash of colour to the versions not destined for the monochrome Kindle. I was particularly pleased that the presence of a piece featuring the seventh Doctor reviewing the debut of the ninth allowed Jamie to include Sylvester McCoy amongst the drawings, and there is also a lovely nod to the Jon Pertwee era in his illustration of Matt Smith. There are some omissions. We don’t ever seem to have done a feature with Catherine Tate where she talks about her role in the show much, and I also would have liked to include any Doctor Who snippets from some other significant guest stars like John Simm, Derek Jacobi or Simon Callow. Kylie and David Morrissey do feature briefly, but only quoted in a lengthy feature about David Tennant’s departure from the show. For someone who is such a technophile, I have to confess that if you are editing a book, nothing beats pen and paper for marking up changes and corrections. By Martin Belam on 21 November 2011.